After the visit to the Kerio Delta, closer to ‘home’ at TBI, we investigated the riverine ecology. This involved jumping into the river and getting wet. It wasn’t hard to convince everyone to do so in the middle of a hot sunny morning! There were a lot of tiny invertebrates, molluscs and even fish that we came across. 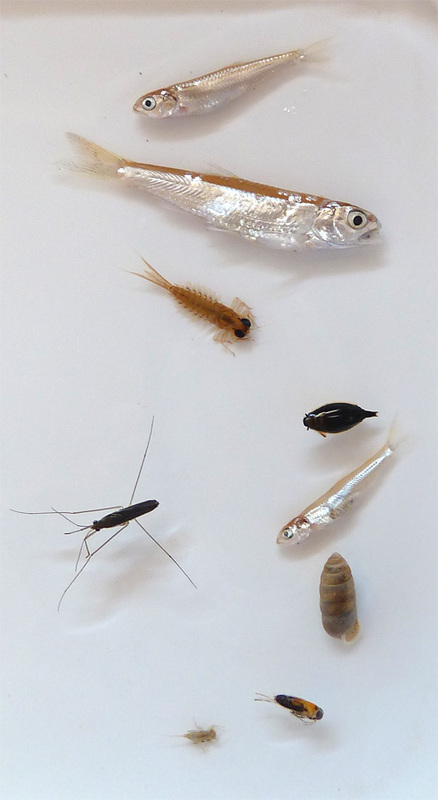 Here is an image showing some of the aquatic biodiversity that occurs in the Turkwel River right by TBI. The students worked hard to find the larvae and other creatures that were hiding in the riverbed. One challenge larvae face here is holding on to the sand that is swept away daily by the movement of water. The insect larvae and other creatures in the river are part of an intricate web of life that may be hidden from view in the muddy water, but is an important part of the local food chain and riverine biodiversity. The fish from the river is a characid (Family Alestidae, Order Characiformes, Class Actinopterygii – Ray-finned fishes) in the genus Micralestes. Even as adults, these Micralestes are tiny, as you can see from the photograph of our samples. We had found this fish before, but it appears and disappears based on the river’s fluctuating flow (which is both due to rainfall in the distant Cherangani Hills and Mt. Elgon as well as release of water from the Turkwel Gorge Dam). The students had spent about an hour sampling the river before the first fish was caught by Sarah. Then the race was on to see if others could find them. We found a few more, but as the river is currently in a low-flow phase, there weren’t very many of them around. The most common creatures we found were various insect larvae including those of dragonflies and damselflies. Like the winged adults, the larvae are voracious predators of anything they can catch in the water, including the small fish! In the shallow edges near vegetation Water Striders and Diving Beetles were common, both feeding on small terrestrial insects who had the mishap of falling into the water. After several hours of sampling the river’s biodiversity and learning about freshwater ecology, the students decided to have a mud-fight and a swim. As the professor, luckily I was spared from the mud-fight! By Dr. Dino Martins|2017-01-04T18:05:23-07:00October 8th, 2011|Field Schools|Comments Off on River Wildlife!